Patterns are now shipping, so now we can gear up for some fun giveaways coming up in the next week. My International Director of Shipping (i.e. newly-11-year-old) and my Chief Ironer (the one who sewed half of the Under the Veranda Sampler but doesn't like exalted titles - but she is the power behind the throne, so to speak) were busy bagging items while they watched Cake Boss last night. Then I was busy bagging patterns well into what remained of the night while watching pretty much anything remaining on the DVR. Lots and lots of bags. Lots and lots of patterns. Lots and lots of late night TV. There are only two patterns I've yet to introduce, so I'll cover one today and be back with another tomorrow. Re-introducing Garden Jewels... It was a quilt that was featured in Quiltmaker this summer and I've gotten lots of requests to see this in pattern form. 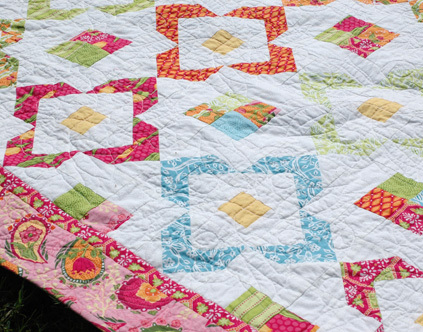 What a pretty quilt. It's definitely on my to-do list. I had to save that one to my favorites! 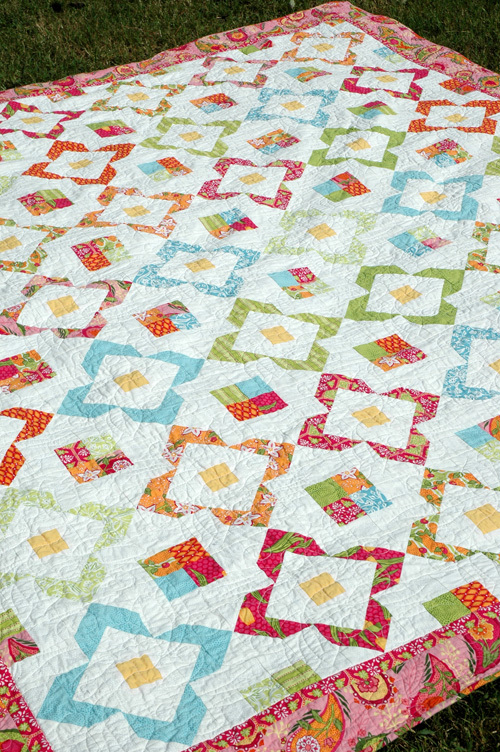 It even looks Accuquilt GO! Baby friendly. Love that part too. Can't wait to see what you have to post for us tomorrow. I love it! I think it might be my favorite. Ooooooo these are looking enticing!! AHHHHH! Another pattern of yours that I WANT and I WANT TO MAKE NOW. But there isn't nearly enough time as it is to sew. And I'm sure hubby and the kidlets would not be happy if I forgot to go grocery shopping or do the laundry. Perhaps over the long holiday weekend I will get some much needed studio time. I love the use of child labor, especially while watching tv. Terrific pattern and ingenious system of getting the patterns packed with the kids...a true family affair! Thanks for sharing. that is great. I really like that you have the pattern in color. fun! Love Garden Jewels! Love the bright and fun colors. Best of everything on the patterns. Garden Jewels is awesome -- but even more awesome is your pool of talent there....it's so hard to find good help, and you lucked out on a shipping director *and* a chief ironer! Whoohoo! (Any chance your chief ironer will consider taking on some outside work? LOL) Heehee! Ooh LOVE this pattern Amanda. So pretty. I love this pattern! 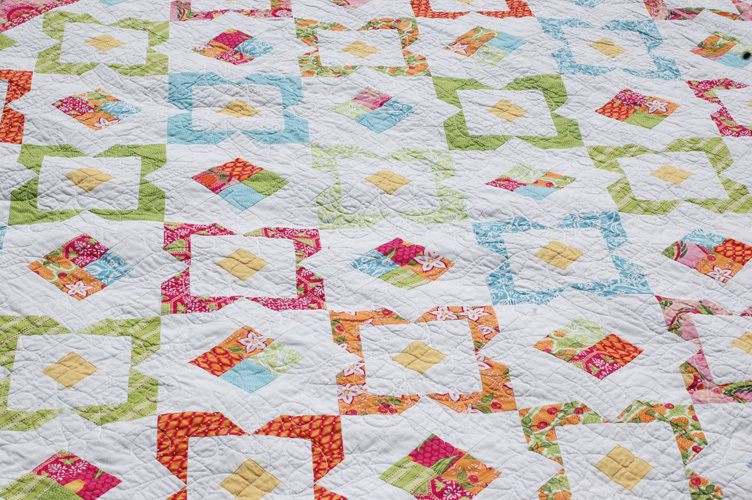 It combines both a vintage look with the fresh new fabrics that are on the market today! I really like "garden jewels" with Veranda fabric of course! Where can I purchase Garden Jewls? I found the pattern and the magazine.In the magazine are there all the instructions to make the quilt? Laura- tried to email you but it bounced. You can get a pattern at fat quarter shop but, yes, if you have the original magazine you can use those directions to make the pattern. Happy sewing! Gorgeous! 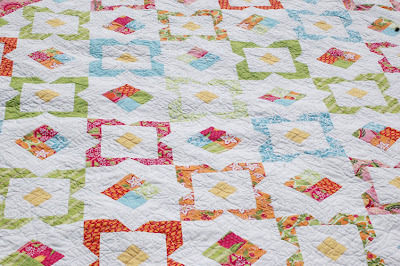 I'm just getting interested in quilting and found your blog through Fat Quarters. I love it!